MMA Event Quake in the Cage 6 | MMA Fighting Events Videos Techniques UFC Fight Picks and News. This Saturday June 25, live MMA (Mixed Martial Arts) event action returns to the Los Angeles area. 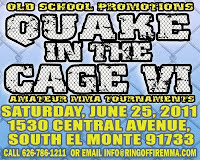 Ring of Fire MMA and Old School Promotions bring their Quake in the Cage MMA event back to the Los Angeles area after a short tour in Orange County. 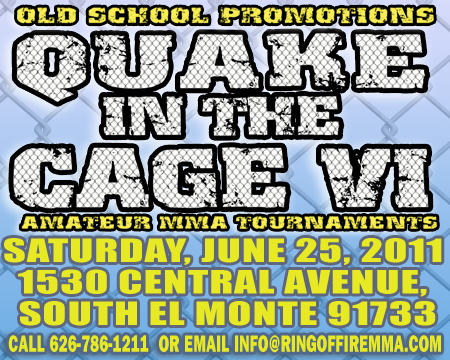 Quake in the Cage 6 is a CAMO sanctioned MMA event and will take place at the South EL Monte Community Center in the city of South El Monte. Headlining Quake in the Cage 6 is a light heavyweight title fight. Brock Combs and Michael Perez will be stepping inside the cage to do battle but only one of these fighters will l come away with the 205 lbs belt. This is what happened last time Brock Combs fought a Quake in the Cage event. As a special treat, this MMA event will feature the live sounds of Pueblo Meat! Make sure to get to Quake in the Cage 6 early so you can catch the live performance. Doors to the Quake in the Cage 6 MMA event will open at 5 p.m. Live bands will be playing and then the fights get going at 7 p.m. The address to this MMA event is 1530 Central Avenue, South El Monte 91733. Make sure not to miss this event if you're in the Los Angeles area and you're an MMA or fight fan. Check out some of the Best MMA Fights from Bellator. 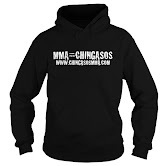 Want to train in MMA? Check out Los Angeles MMA Gyms and Schools.